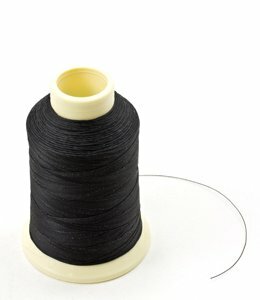 CoversDirect® is pleased to offer Coats Ultra Dee polyester black bonded thread. Made from a high strength, resilient and continuous filament polyester, our thread is corded and heat set to minimize shrinkage and stretch. The bonded finish adds strength and reduces fraying. Need other colors? No problem, we can get those. Simply give us a call, toll free, at 1-866-626-8377. Need thread for your outdoor project? SunStop thread is designed specifically for outdoor use and is made of 100% continuous filament polyester with enhanced UV and fade protection and a non-wicking finish. Excellent for use on tents, awnings, canvas and marine application requiring advanced UV protection.